Established in 2017, our smaller South of the River partnered location can be found on the corner of Cecil Ave and Lake Street in Cannington. In 2018 we were thrilled ownership of the Cannington salon was taken over by one of our team members whom had been our own manager in store since the outset. Located just a few moments from Westfield Carousel there is plenty of free parking available directly outside the salon at the Cecil Avenue complex. Both locations are fully equipped for all your spray tanning, eyelash extensions and lash lift needs. Sessions are available by appointment during the hours below. Please note increased hours and availability are available in North Perth if you are not able to secure your desired time. Sun: Group bookings (3+) only by request. SMS: 0422 783 553 or click to book online. 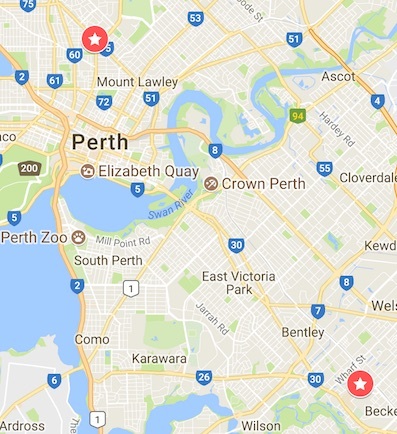 Click here for the North of the River location North Perth Lash Salon.